The Drakensberg (Afrikaans: "Dragon's Mountain") mountains are the tallest in Southern Africa, rising at Thabana Ntlenyana to 11,422 feet (3,482 m). In Zulu, they are referred to as uKhahlamba ("barrier of spears"), and in Sesotho as Maloti ("mountains"). The range forms the northeastern arc of Lesotho's circumferential boundary with South Africa. They are distinctive due to their geological formation among mountain ranges. Only the Simien Mountains in Ethiopia resemble the Drakensberg range. The mountains contain a diversity of habitats which protect a large number of native and globally threatened species, especially birds and plants. The mountains were declared a World Heritage Site in 2000. The site contains numerous spectacular caves and shelters and the largest and most concentrated group of rock paintings in Sub-Saharan Africa. These artifacts were made by Bushmen or San people over a period stretching 4000 years into antiquity. The rock paintings are outstanding in quality and diversity of subject and in their depiction of animals and human beings. The paintings, for the most part, depict the San people's view of spiritual life. The Drakensberg are located in the eastern part of South Africa, running for some 600 miles (1,000 km) generally southwest to northeast, with a northwesterly bend forming the northeastern border of Lesotho with South Africa. They are drained on the west by the Orange and Vaal rivers and on the east and south by a number of smaller rivers, the Tugela being the largest. The range thus separates KwaZulu-Natal Province from Free State Province, looming over the nearby coast of Natal. Location of the Drakensburg/Maloti Range in South Africa and Lesotho. The Rockeries, Mnweni, Northern Drakensberg. The highest peak is Thabana Ntlenyana (11,424 feet or 3,482 m), also the highest peak of Lesotho. Other notable peaks include Mafadi at 3,450 m, Makoaneng at 3,416 m, Njesuthi at 3,408 m, Champagne Castle at 3,377 m, Giant's Castle at 3,315 m, and Ben Macdhui at 3,001 m. All of these are in the area bordering on Lesotho; north of Lesotho the range gradually becomes lower and less rugged until entering Mpumalanga, where the quartzite mountains of the Transvaal Drakensberg are more broken. The Blyde River Canyon in Mpumalanga is technically within the northern reaches of the Drakensberg, though its geology appears quite different due to the lack of a basalt cap. The range is divided into three main regions, namely the Northern, the Central, and the Southern Drakensberg. The Northern and Central Drakensberg areas have some of the most beautiful scenery. 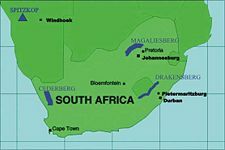 The area falls into four valleys, beginning with the Champagne Valley in the Central part, through the Cathedral Peak and Didima Valley, then the Royal Natal National Park and Amphitheater Valley, and finally the Middledale Pass and "Lost" Valley in the Northern Berg. Each has its own kind of beauty and character; all have magnificent mountain views. The Champagne Valley area contains some of the highest peaks of the Drakensberg Mountains: Cathkin, Champagne Castle, and Monk’s Cowl. Cathkin was named after an area around Glasgow, Scotland, by the first Scottish settlers in the Drakensberg. Champagne Peak received its name as a result of the first climber to reach its peak taking a bottle of champagne to celebrate his achievement and accidentally dropping it. Champagne Valley is also noted for its sports activities, especially golf. 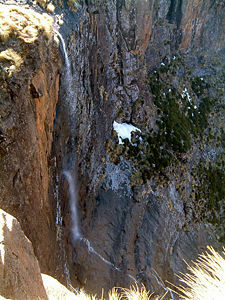 The Cathedral Peak area includes Doreen Falls. Another natural feature is Rainbow Gorge, where two enormous boulders form a wedge. This area offers some of the most challenging climbs in the entire Drakensberg. Named after the Didima gorge nearby and its many rock art sites, the new Rock Art Center is being developed here. Guided walks may be taken to the many rock art sites in the area. The Royal Natal National Park is located in the KwaZulu Natal province of South Africa. Notwithstanding the name, it is not a South African national park managed by SANParks, but rather a provincial park managed by Ezemvelo KZN Wildlife. Tugela Falls, the second highest waterfall in the world, is located within the park. In the Amphitheater, the Drakensberg rises straight up to a height of over 3000 feet. The Lost Valley is a remote area and unique geographical feature. This was reportedly the home of a “white tribe” descended from Piet Retief’s Voortrekkers as they came into Natal via Retief’s Pass in 1837. Of historical interest is a man-made suspension bridge, still in working order. This area has an abundance of birds, making it an ideal location for birding enthusiasts. Geologically, the Drakensberg is a remnant of the original African plateau. The mountains are capped by a layer of basalt up to 1,500 m thick, with sandstone lower down, resulting in a combination of steep-sided blocks and pinnacles. The sandstone layer was deposited as the remnants of a gigantic lake that occupied much of what is now Southern Africa ca 500 million years ago, whereas the basaltic layer was deposited ca 220 million years ago in what many geologists think was the largest volcanic eruption in the history of the world (linked with the splitting of the tectonic plates of Africa and South America). Subsequently, water and wind erosion (principally from the east, facing the Indian Ocean) cut into the enormous plateau, producing an extraordinary and almost unique landscape. The Drakensberg is one of only two mountain ranges (along with the Simien Mountains of Ethiopia) to have been formed in this geological way, which accounts for its extraordinarily distinctive formations and colors. The landscape is dominated by extremely steep cliffs, some of them regarded as being among the most impressive cliff faces on earth, incised buttresses, and soaring ramparts. Drakensberg range from space showing brown basalt and pale sandstone layers. Snow falls regularly in the winter, while rain and mist can occur year-round. In summer the valleys of the mountains often see temperatures in the 90 to 100 degrees Fahrenheit range (mid to high 30 degrees Celsius), while in winter temperatures on top of the mountains may plunge to -4 degrees Fahrenheit (below -20 Celsius). Snow is known even in summer, and Cathedral Peak Hotel, one of the most popular resorts in the Drakensberg, has known a white Christmas. Because of the different climate zones, great differences in altitude and a copious supply of water, one finds in the Royal Natal National Park an extreme diversity of plants, most of which are perennials. So far, more than 2000 species were registered, most of them blossom-bearing. There are 72 species of ferns alone, among them the huge fern trees typical of the Drakensberg. Drakensberg is considered a montane grasslands and shrublands biome as defined by the World Wildlife Fund. Such areas, particularly in subtropical and tropical regions, often evolved as virtual islands, separated from other montane regions by warmer, lower-elevation regions. There are 48 reptile species, 26 frog species, 74 butterfly species, 299 bird species, and 48 species of mammals to be found in the park. Among the mammals to be found are baboons, jackals, mountain reedbucks (an antelope that eats grasses and leaves), grey rhebucks (an antelope that browses on shrubs and forbs), and elands. The bearded vulture has undergone serious population declines in southern Africa and is now restricted to the Drakensberg Mountain range. These declines have been blamed on reduced prey, changing animal husbandry practices, and direct persecution. In Lesotho, for example, the bird is killed for its plumage, which is used in traditional ceremonies. San rock art, uKhahlamba Drakensberg. The painting depicts an eland. Caves are frequent in the more easily eroded sandstone, and many have rock paintings by the Bushmen (San). The Drakensberg contains thousands of works of Bushman art and is the largest collection of such work in the world. These paintings are considered to be unique mainly because they represent the earliest specimens of rock art where color and dimension were introduced. Due to the materials used in their production, these paintings are difficult to date, but there is anthropological evidence, including many hunting implements, that their civilization existed in the Drakensberg at least 40,000 years ago and possibly over 100,000 years ago. The Bushman population was decimated in various wars from the seventeenth century, mostly between them and other African tribes invading the fertile area. Ultimately they were completely annihilated by Europeans in the nineteenth century, due principally to confusion over claims to land and hunting animals. Being hunter-gatherers, the Bushman did not believe in ownership of livestock but did believe strongly in hunting grounds (the opposite of the view held by Europeans). Thus the Bushman would hunt European livestock, and the Europeans would infringe on hunting grounds, neither with a concept that they were transgressing a rule of the other. Both sides responded, with Bushmen raiding the Europeans and Europeans attacking the Bushmen. The superior technology of the European guns and weapons spelled certain disaster for the Bushman, and the last one was seen in the late nineteenth century. There are still Bushmen tribes dwelling in the Kalahari and Namib deserts, but the culture of mountain Bushmen no longer exists. Tugela FallsLink title, with a drop in five free-leaping falls totaling 3,110 ft (947 m), is the world's second highest waterfall after Angel Falls in Venezuela. Tugela's tallest single drop is 1350 ft (411 m). 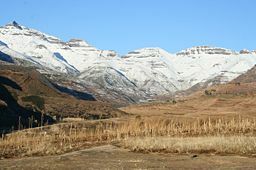 In the southern Drakensberg there is a ski resort called Tiffindell that is open from late May to early September. Tiffindell may receive as much as 2.5 meters of snow during good skiing years. Many of the Drakensberg peaks offer challenging mountaineering. While the major summits have all been conquered, a number of minor pinnacles have yet to be ascended. Hiking is a popular activity, as are fishing, swimming, whitewater rafting, horseback riding, and birdwatching. Tourism in the Drakensberg is developing, with a variety of hotels and resorts appearing on the slopes. Most of the higher South African parts of the range have been designated as game reserves or wilderness areas. The uKhahlamba or Drakensberg National Park, located in KwaZulu-Natal, near the border with Lesotho, was listed by UNESCO in 2000 as a World Heritage Site. The park is also on the List of Wetlands of International Importance. But it is the central Drakensberg that offers tourists the best access to Bushman rock art and the largest range of hiking trails. The best-known national park in the Drakensberg is Royal Natal National Park, where the Amphitheater can be seen, a rock wall approximately five kilometers long and 500 meters high. It contains the source of the Tugela River and includes Tugela Falls, the second highest waterfall on earth. The total drop in five free-leaping falls is 3,110 feet (947 m). The source of the Tugela River (Zulu for "sudden") is at Mont-Aux-Sources, several kilometers from the escarpment from which the falls drop. Mont-aux-Sources is also where, as its name implies, the Orange River begins its journey to the Atlantic Ocean. People living in and around Africa's mountains may be at greater risk from volcanoes, earthquakes, and landslides than has previously been supposed. Chris Hartnady, a South African geologist, told the Mountains High Summit Conference for Africa in 2002 that the effects of such natural hazards on vulnerable populations are probably being aggravated by the development of big infrastructure projects such as dams and reservoirs in mountain areas. Urgent efforts are needed to strengthen Africa's understanding, monitoring, and early warning of potentially devastating seismic events. Planners and emergency response experts should also draw up strategies for reducing the threat to vulnerable populations including introducing and enforcing earthquake proof building codes, researchers believe. "Mountain areas appear very attractive places in which to site reservoir or hydroelectric schemes. However in East and Southern Africa, these high-lying areas are usually associated with tectonically active belts near faults and rifts in the earth's crust," Hartnady argues. It means that crust is already under huge stress and strain, making it sensitive to the massive pressures and forces created when millions of tons of water are impounded in a dam or reservoir. For example, shortly after water began to be impounded in the Katse dam built in the Maluti-Drakensberg mountains in October 1995, tremors began to be felt. A seismic event, measured at magnitude 3.1, was recorded on January 3, 1996. Hartnady believes the addition of the Mohale dam to the extra water load on the earth's crust already present behind the Katse dam could trigger "much larger, reservoir-induced, earthquakes in this area of natural seismic activity." ↑ Ezemvelo KZN Wildlife. uKhalamba Drakensberg Park - Royal Natal Retrieved February 21, 2009. ↑ Drakensberg Tourism. Drakensberg Retrieved February 20, 2009. ↑ 5.0 5.1 Bryan Swan and Dean Goss. Tugela Falls World Waterfall Database. Retrieved February 24, 2009. Drakensberg Tourism Association. Drakensberg Retrieved February 24, 2009. UNESCO World Heritage Centre. uKhahlamba / Drakensberg Park Retrieved February 24, 2009. This page was last modified on 10 October 2017, at 16:11.